Bedford’s Wes Lippincott, right, takes the handoff from teammate Miles Washington at the Bisons took second in the 400 relay at the Bedford Giant Eagle Invitational. 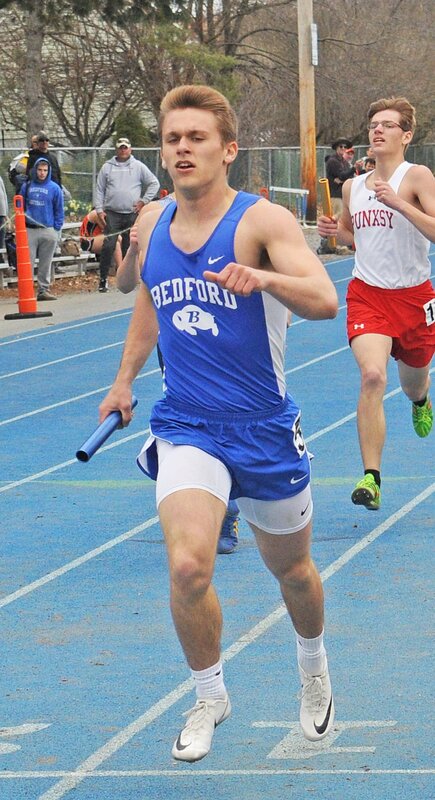 Bedford’s Mitchell Zembower finishes the 1600 relay in second place at the Bedford Giant Eagle Invitational, Saturday. Chestnut Ridge’s Isaac Little takes second in the 800 at the Bedford Giant Eagle Invitational. Everett’s Jason Clark took fifth in the shot put at the Bedford Giant Eagle Invitational. Tussey Mountain’s Jarred Sipes took third in the 100 at the Bedford Giant Eagle Invitational. Everett’s Aubrey Hall placed tenth in the shot put, but she was second in the discus at the Bedford Giant Eagle Invitational. Tussey Mountain’s Meghan Molosky finishes third in the 200 at the Bedford Giant Eagle Inviational. 1. L. Speigle, Shade, 12.99; 2. K. Maxwell, Everett, 13.04; 3. M. Hostetter, Shade, 13.05. 1. M. Hostetter, Shade, 27.48; 2. Speigle, McConnellsburg, and M. Molosky, Tussey Mountain, 28.14. 1. L. Spiegle, Shade, 60.21; 2. K. Maxwell, Everett, 1:04.04; 3. S. Emert, Shade, 1:03.05. 1. E. Coddington, Shade, 2:29.25; 2. K. Maxwell, Everett, 2:30.68; 3. M. Tokarsky, Windber, 2:37.97. 1. E. Coddington, Shade, 5:27.14; 2. O. Roman, Conemaugh Township, 5:50.39; 3. No on under 6:00. 1. Dibert, Bedford, 13:45.3; 2. O. Roman, Conemaugh Townsip, 14:01.25; 3. No others under 14:15. 1. Shade, 51.58; 2. Tussey Mountain and Southern Fulton, 55.24. 1. Shade, 4:17.21; 2. Southern Fulton, 4:33.64; 3. Bedford, 4:33.67. 1. Bedford, 11:05.56; 2. No others under 11:30. 1. A. Ferguson, Bedford, 16.54; 2. K. McKenzie, Berlin Brothersvalley, 16.98; M. Sleek, Conemaugh Township, 17.14. 1. K. McKenzie, Berlin Brothersvalley, 49.01; 2. Tokarsky, Windber, 50.37; A. Ferguson, Bedford, 50.45. 1. M. Troutman, Northern Bedford, and K. Hartman, Bedford, 8-0; 3. Several tied at 7-6. 1. J. Pavalosky, Conemaugh Township, 154; 2. Harnish, McConnellsburg, 14-10.5; 3. J. Neri, Windber, 14-8.5. 1. J. Pavalosky, Conemaugh Township, 31-1.5; 2. Yokum, Everett, 31-8; 3. B. Beegle, Everett, 31-0. 1. A. Yokum, Everett, 4-10; 2. M. Faith, Conemaugh Township, and J. Durica, Conemaugh Township, 4-8. 1. H. Dodson, McConnellsburg, 35-10; 2. Gregor, Bedford, 31-11.5; 3. Watkins, Tussey Mountain, 30-10. 1. Truax, McConnellsburg, 93-11; 2. Watkins, Tussey Mountain, 90-0; 3. Hall, Everett, 88-0. 1. D. Gordon, Southern Fulton, 93-7; 2. Hall, Everett, 89-11; 3. L. Yanksoky, Berlin Brothersvalley, 87-0. 1. Sipes, Tussey Mountain, and Foor, Bedford, 11.54; 3. C. Ebersole, Northern Bedford, 11.64. 1. Rhodes, Tussey Mountain, 23.93; 2. Sipes, Tussey Mountain, and Lippincott, Bedford, and Zembower, Bedford, 23.94. 1. N. Maxwell, Everett, 53:14; 2. M. Zembower, Bedford, 53.50; 3. C. Spade, Southern Fulton, 54.74. 1. N. Maxwell, Everett, 2:11.04; 2. Volk, Shade, 2:11.53; 3. I. Little, Chestnut Ridge, 2:12.49. 1. V. May, Bedford, 3:43.14; 2. E. Williams, Conemaugh Township, 4:44.26; 3. I. Zimmerman, Northern Bedford, 4:45.74. 1. V. May, Bedford, 9:54.55; 2. I. Sherlock, Northern Bedford, 10:35.04; 3. T. Napora, Windber, 10:41.13. 1. Bedford, 45.14; 2. Tussey Mountain, 46.34; 3. Northern Bedford, 47.04. 1. Bedford, 3:43.14; 2. Southern Fulton, 3:52.04. 1. Conemaugh Township, 8:57.26; 2. Northern Bedford, 9:08.54; 3. Chestnut Ridge, 9:09.13. 1. J. Vasas, Windber, 17.7; 2. Ford, Bedford, 18.1; 3. Mellott, Everett, 18.14. 1. J. Vasas, Windber, 42.20; 2. Ford, Bedford, 46.04; 3. No others under 46.6. 1. D. Smith, Tussey Mountain, 11-6; 2. T. Ah Loe, Southern Fulton, 11-0; 3. Several tied at 10-6. 1. L. Pfister, Chestnut Ridge, 21-10.5; 2. A. Foo, Bedford, 19-8; 3. Washington, Bedford, 18-11.5. 1. B. Clingerman, Everett, 39-0; Washington, Bedford, 38-11; C. Donaldson, Northern Bedford, 38-9. 1. L. Pfister, Chestnut Ridge, 6-6; 2. B. Clingerman, Everett, and J. Growden, Bedford, 5-10. 1. D. Knisely, Chestut Ridge, 52-11.5; 2. MIlburn, Chestnut Ridge, 45-1.5; J. Clark, Everett, 44-2.5. 1. D. Knisely, Chestnut Ridge, 170-7; 2. D. Lemin, Tussey Mountain, 122-2; 3. Lynch, Bedford, and Cornell, Bedford, 113-9. 1. Cook, Bedford, 164-11; 2. C. Weist, Tussey Mountain, 152-0; 3. Vent, Bedford, 138-3. Rain likely. Low 59F. Winds SSE at 10 to 15 mph. Chance of rain 80%. Rainfall around a half an inch.